Wonderful mountain retreat on Lake Cherokee, located in the Northwest corner at the foothills of the Sumter National Forest of South Carolina. This 3 level home is designed for easy living. With a flat driveway, a driveway to the lower level and easy access to the waterfront dock and walkway, your days of relaxing and enjoyment await you. Private Mountain Lake home with Gorgeous Views! Level lot for easy access to the Lake and great for family gatherings and Play time. Water level is gradual to deep water perfect for swimming. This lot and has it’s own private boat ramp. Concrete Boat House to keep your boat inside plus a tie up dock area. The Rooftop is built for sunbathing and relaxing to enjoy the views. This lovely cabin on Lake Cherokee is the perfect place to escape from your cares. Soak in the panoramic views from the 1,100 ft. of wrap around porch or put your chairs on your dock and enjoy the lake Cherokee sunsets. Built in 2013 this quality built home features poured concrete walls, 2x6 exterior walls, cement board siding, a Trane 20i XL Heat pump and a gas instant water heater. This is a diamond in the rough. The owner has a surveyor going out to set the pins. I have red surveyor's tape at APPROX ends of lot on road. Then lot will be under brushed. The lot has a GREAT view all the way down the lake from the building site. Stream on left side of lot for privacy. So much for so little. This is a summer "camp" that the family built over time back in 1969. It has no central AC or Heat but does have large, working FP with window AC's. It is a one room/great room with two BR's that were added on. There is a bath with stall shower. The house needs some TLC. However, the lot is fabulous! Huge views of the lake with the mountains RIGHT THERE. NEARLY 250 ACRES OF FRESH MOUNTAIN WATER FED BY STREAMS AT THE EDGE OF THE BLUE RIDGE MOUNTAINS MAKE LAKE CHEROKEE A HIDDEN GEM. THIS PRIVATE LAKE BORDERS ON SUMTER NATIONAL FOREST AND IS A SCENIC CAR RIDE FROM THE NORTH CAROLINA AND GEORGIA MOUNTAINS. 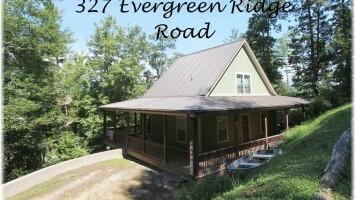 THE WOODED LOT OFFERS AN INCREDIBLE CASCADING VIEW OF THE APPALACHIAN RANGE. MOTIVATED SELLER! This is for two lots combined. Septic tank permit and well permit on file. Lake Cherokee (also known as Lake Isaquenna) is a 300 (+/-) acre private lake at the edge of the Sumter National Forest near the area known as Tamassee. Lake Cherokee is the largest of several private lakes in the Oconee mountain region. Motivated SELLER SAYS MAKE ALL OFFERS KNOWN!!! Lake Cherokee (also known as Lake Isaquenna) is a 300 (+/-) acre private lake at the edge of the Sumter National Forest near the area known as Tamassee. Lake Cherokee is the largest of several private lakes in the Oconee mountain region.